The Census Bureau reported today that the U.S. homeownership rate increased to 66.3% in the third quarter from 65.9% in the second quarter (see chart above, data are not seasonally adjusted). The 0.40% increase in the July-September period was the first gain in two years for the nation's homeownership rate, and the largest quarterly increase in homeownership since the second quarter of 2004, more than seven years ago. 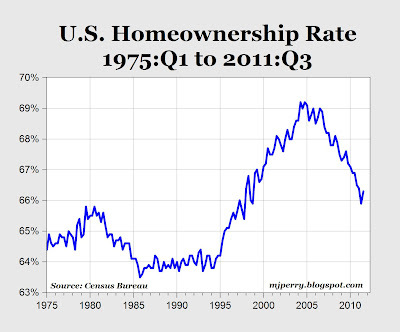 Does that mean the seven-year decline in homeownership that started in the fourth quarter of 2004 when the rate peaked at 69.2% has finally bottomed out? It's just a one-quarter increase, and could be a blip. But especially because it's the largest quarterly gain since 2004, could this be a signal of some increased stability in the real estate market? Or not? I bought a house last quarter - nicer houses that were not in short sale were going fast. Lots of houses are being sold, but because of all the foreclosures and short sales, the prices are still going down in my market anyway (Phoenix). Dropping prices probably explains why houses are selling better and more people are owning. If they would just let the prices bottom out I think this all would happen much more quickly. In our area - an exurb to the DC area, NEW homes are being built and sold even as we have a large number of foreclosures. "Foreclosure filings declined 34 percent in the third quarter from a year earlier as states continued to probe allegations of foreclosure “robo-signings” and lenders scrutinized paperwork, according to RealtyTrac. Default notices rose 14 percent in the third quarter from the prior three months." "MasterCard Inc. (NYSE: MA) absolutely crushed estimates this morning, reporting third-quarter EPS of of $5.63 on revenue of $1.82 billion. High unemployment and stagnant wages are the likeliest causes of the increase in credit card use. The concern is that the uptick in credit card use will lead to a similar uptick in delinquencies and defaults." * The data are not seasonally adjusted. Comparing to 2010Q3, the rate declines by 0.6 (from 66.9% to 66.3%). * But the seasonally adjusted series from Commerce indicates a 0.1 increase from Q2 (66.0 in Q2 to 66.1 in Q3). * However, the old dictum of a point does not make a trend applies here. Just a quick inspection of the graph shows that one quarter jumps are just hiccups in the downward trend. * Further, how can the homeownership rate increase when we are still seeing nearly a quarter million homeowners being foreclosed a quarter? I.e., they are becoming renters. it's very doubtful this has bottomed out. new mortgage purchase applications/issuance remain pinned at the lows. a new wave of foreclosures looks set to hit in the near term. overall transaction volume is low. you have to be very careful using sequential data here as real estate is a highly seasonal market. year on year, the number dropped 0.65.
also note, the error rate here is 0.4%, which puts the entire sequential gain within the margin of error. obviously, this is better than a sequential decline, but there is really not much to hang your hat on here yet. Why is this a good thing? 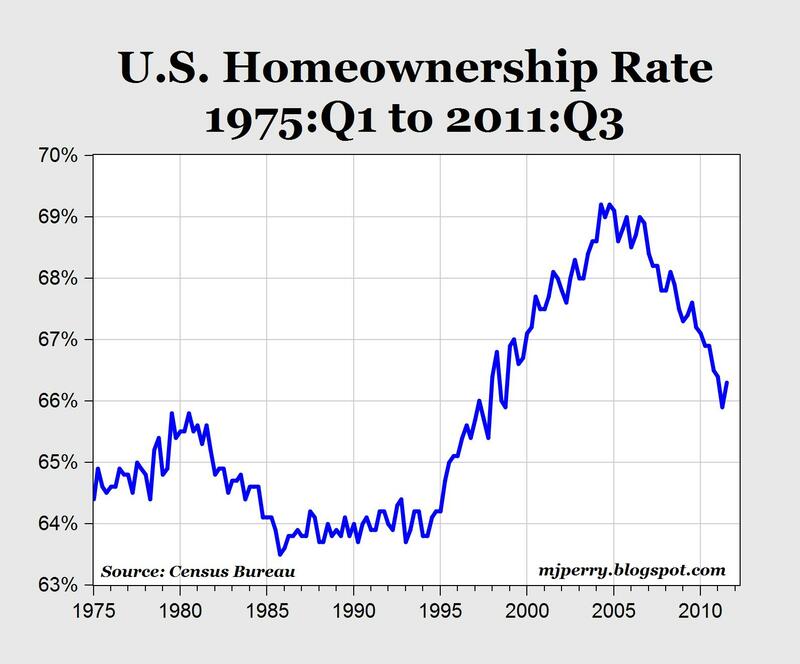 The last time people who could not afford them bought plenty of homes the US economy got in a lot of trouble.